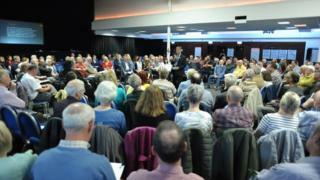 Hundreds of SNP members have met in Edinburgh to discuss a new economic blueprint for independence. The national assembly meeting was part of a series of events aimed at gathering views on the findings of the growth commission. Published in May, it set out a recommendations for the economy in an independent Scotland. Meetings have already been held in Ayr and Aviemore, ahead of the party's autumn conference in October. The Scottish Conservatives said Scots voted "decisively" to remain in the union in 2014, and said the meetings showed there was a "deep and substantive division" between the SNP's vision and "the democratic will of Scotland". The growth commission was set up by Nicola Sturgeon and chaired by former SNP MSP Andrew Wilson. Its proposals included keeping Sterling without a formal currency union after Scotland leaves the UK. A separate Scottish currency could be set up after a period of about a decade, but only if six key economic tests were met, the commission said. The move would see the Bank of England continue to set interest rates and other monetary policy in the years after independence. The commission also said it would take 10 years to get Scotland's deficit rate under control, while an independent Scotland would take up to 25 years to match the economic performance of other small countries such as Denmark, Sweden, Norway and New Zealand. Ms Sturgeon said the report sets out an alternative to Westminster's "austerity", but the document has been criticised by some Yes supporters as well as opponents of independence. SNP depute leader Keith Brown, who chaired the Edinburgh event, said: "Our party and the independence movement is in great health." He added: "The national assemblies have successfully tapped into the enthusiasm for and possibilities of an independent Scotland. "The Edinburgh event was the biggest national assembly we've ever held and there was a real buzz about the venue. Member led group debates - on the growth commission report's findings and a whole lot more - gave us really valuable feedback. "And this is just the start of the conversation. New online resources will allow SNP branches across the country the opportunity to have their say on the growth commission and wider discussions, both with the Yes family and civic Scotland, will take place in the coming months too." The Scottish Conservatives have argued against having a second independence referendum. Deputy leader Jackson Carlaw said: "The SNP party faithful can get together for coffee and a blether as often as they wish but it doesn't alter the fact that the people of Scotland voted decisively to remain part of the United Kingdom in 2014. "Keith Brown's comments only illustrate the one deep and substantive division - between the SNP and the democratic will of Scotland."